When I began researching the Charles Camsell Indian Hospital and then the cairn in the Aboriginal Cemetery in St. Albert, I had no idea where it would lead. This is generally the case for those of us who are researchers and writers and historians. We are taken with a topic, often for reasons we don’t fully understand, and then we follow our gut instincts. Often, like the famous mosaic in the Camsell Hospital, we don’t know what we’ve created until all the pieces are in place and we’re standing back looking at it. I had no idea, for example, when I looked in that archive box last month that this online project would be read around the world, or that I would be connecting with more people in the Arctic, trying to help them track down loved ones. I only knew that I was haunted by this story and wanted to find ways to be an ally on the journey toward reconciliation. I wanted to try doing history ‘out in the open’ in a transparent and engaging way. To listen and ask questions and collaborate with others more. I certainly didn’t realize before that this year marks the 25th anniversary of the cairn dedication. 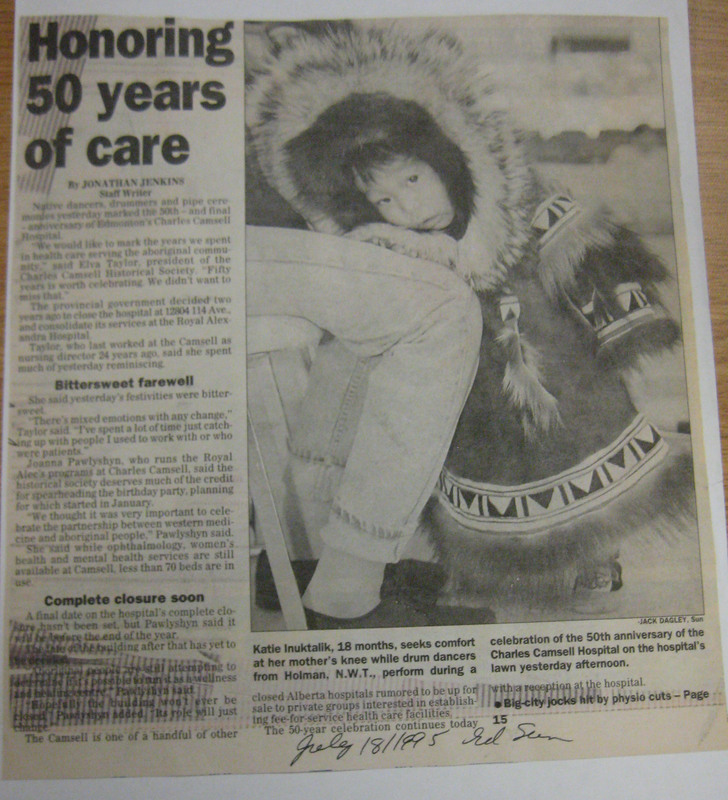 In 1995, Elva Taylor, who had been so instrumental in the Camsell Mosaic history project in 1985 and then the cairn in 1990, spearheaded the 50th anniversary of the Camsell as well. In contrast with the cairn dedication, this ceremony really highlighted indigenous connections. It started Monday, July 17 at 8 a.m. with a pipe ceremony. For two days, people gathered on the hospital grounds. There was a traditional feast, prayers and a flag raising and the whole shebang ended at 7 p.m. on July 18 with a round dance. Inuk author Minnie Aodla Freeman offered a talk, “Leaving Home”, on both days. There were displays of artwork, crafts and old photographs. It’s been twenty-five years since the cairn was erected. Next year will be fifty years since they changed the Camsell from a segregated Indian Hospital to a general Provincial Hospital. These are big milestones in the world of commemorations, and in mainstream Canadian society, we really like big milestones as you can see from Elva’s 1995 undertaking. They are certainly good opportunities to remember – but also to create memory, to build our collective memories around key events. We’re doing a lot of it right now around the First and Second World Wars, and will be gearing up for Canada’s 150th birthday soon. Often we look to what we see as defining moments that we can celebrate. I don’t see, however, why the birth of John A. Macdonald should be celebrated with unadulterated fanfare, or why we should trumpet a whitewashed Confederation. James Daschuk, other scholars, and elders, have certainly exposed some of the Macdonald’s government’s more horrific policies (by most standards, present and past) for “pacifying the plains” and the way Confederation is traditionally taught leaves out a lot of the history. I do see value in commemorating the resilience and agency of indigenous people at the Camsell, and the friendships that were forged. I think it’s worthwhile for people today to think about the policies and actions that meant individuals were sent so far from home for treatment and forgotten by the powers that be. The fact that so many people have contacted me in the hopes of tracking down loved ones shows this story is far from over. The fact that so few people I know (myself included for most of my life) have ever heard of Indian Hospitals shows the important gaps in our knowledge. Maybe commemorations will help spread the word. 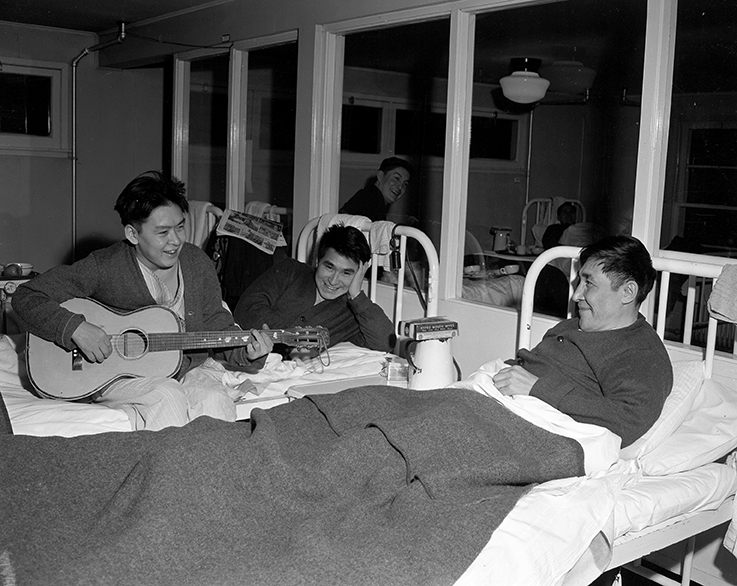 For Jimmy, there could be opportunities to hold healing ceremonies both at the cemetery and at the site of the Camsell. It could also be a way to show non-indigenous Edmontonians that it’s not just “a run-down building” that used to be a hospital; there are major stories there connected to First Nations. “Those two stories have to intersect at some point,” she says. What do you think? What should happen, if anything, this June when the cairn turns 25?